The sun is rising on Sri Lanka’s Foreign Direct Investment (FDI) prospects, a top minister assured yesterday, with officials targeting about $ 2.5 billion for 2018 and eyeing the completion of trade and services agreements with both India and China before the year ends. International Trade and Development Strategies Minister Malik Samarawickrama, in a rare meeting with media, noted that significant efforts would continue on multiple fronts to improve FDI numbers with as much as an 80% improvement expected over the 2017 number of $ 1.63 billion. Such an improvement would land Sri Lanka closer to the $ 2.9 billion mark though he said the target was about $ 2.5 billion. Responding to questions following the signing of an agreement of mutual cooperation between his Ministry and the Industry and Trade Ministry of the Czech Republic, which aims to increase trade and investment between the two countries, Samarawickrama was optimistic of continuing the turnaround in Sri Lanka’s FDI fortunes. Key among these is negotiations over the Hambantota investment zone, which Samarawickrama was confident of completing in “three months” with “quite a lot” of proposals already being received by the Government. Ten other large-scale projects are also under consideration, the Minister added. Though reticent of details, Samarawickrama acknowledged Cabinet approval had already been given for a Liquefied Natural Gas (LNG) plant to be established by a Chinese company that will attract about $ 700 million. 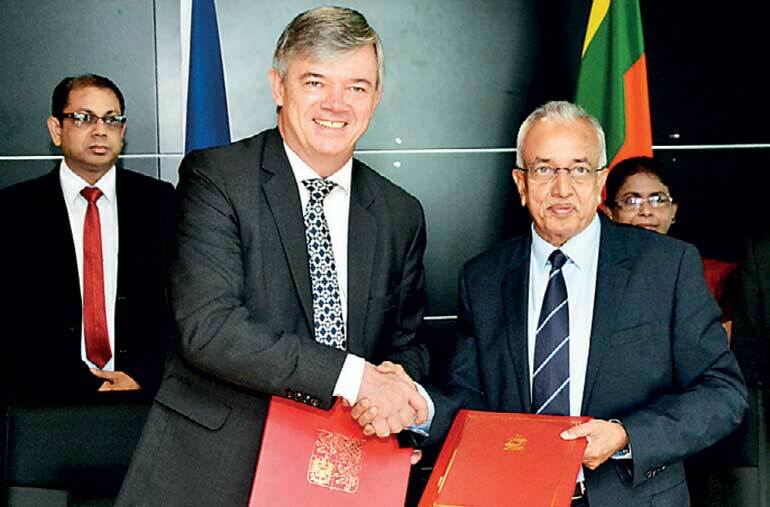 The project, which received Cabinet approval in November 2017, would see the construction of a 400 MW LNG power plant in Hambantota as a Government-to-Government project. The Chinese Government has nominated China Machinery Engineering Corporation (CMEC) to be the implementing partner with the Ceylon Electricity Board from Sri Lanka where the shareholding will be held at a 70:30 ratio respectively. CMEC is also the company that built the Norochcholai coal power plant. A refinery project as a joint venture between Singapore, Japan and the United Arab Emirates, also for Hambantota, is under negotiation and will bring in as much as $ 1 billion FDI, the Minister said. Smaller projects are also receiving focus by departments under the ministry. “We are mostly focusing on manufacturing sectors, which is where the jobs are created. In the past it has been more on the property development sector but now we are focusing more on the manufacturing sector and services. The National Export Strategy (NES) is being worked out and we are looking at IT, boat building, wellness tourism, processed food and other sectors such as electronics and so on,” he said. The NES aims to define roadmaps for expanding exports and analyse performance of value chains for local export focus sectors, market orientation, challenges and opportunities. Minister Samarawickrama last month stated that it could be finalised as early as end February. In addition, the Board of Investment (BOI) recently called for applications from companies interesting in establishing factories in existing free trade zones, which will also be evaluated in the coming months. “Existing zones have a few spots left. At the same time we are developing new zones in Horana, Bingiriya, Mawathagama and Weligama that we expect to be completed by the end of the year,” Samarawickrama commented. Another round of Economic and Technology Cooperation Agreement (ETCA) talks with India will be held later this month. Afterwards a Sri Lankan delegation will take wing to Beijing with the Government hoping to sign both agreements before end 2018. “We are hoping we can conclude both agreements before the end of this year. We are having the next round of discussions with India on 21 February and I will also visit the Indian Minister of Trade and Industry on 20 February to take this forward,” Samarawickrama said. Following his return Samarawickrama hopes to pass through Parliament the anti-dumping bill and the Liability Management Act aimed at improving the management of Sri Lanka’s debt. The Minister also dismissed reports that Sri Lanka was attempting to delay the China FTA. “We are not slowing the FTA down but we have to ensure we get the best deal out of it. We don’t want to rush into things but we want to ensure that the agreement is beneficial to our country,” he said. Sri Lanka exports about $5 million to the Czech Republic and has the potential to expand exports including value added tea, electronics, chemical products, seafood, tobacco and processed foods. The main expectation of the mutual cooperation agreement signed is to increase investment, the Minister said.